What a great gift idea!! Head over to Amazon and get this Crayola Color Wonder Mess Free Art Desk with Stamps for Only $11.99! (Reg. $29). 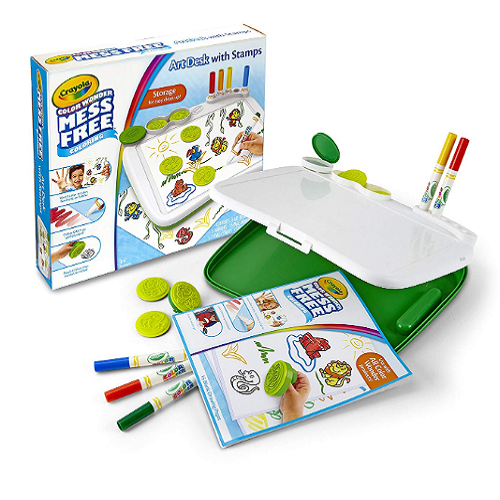 The Crayola Color Wonder Mess Free Art Desk with Stamps features everything kids need to create colorful, mess-free drawings wherever they go. The included Color Wonder markers leave marks only on special Color Wonder paper, so parents will never have to worry about messes on clothing or furniture. This set also includes five jungle-themed stamps and a non-drying ink pad, letting kids easily create fun animal outlines they can color in with the markers. And when they’re done coloring, they can store all the pieces neatly inside the art desk and take it with them anywhere they go.